Sopa de Pollo aka Chicken Soup is undoubtedly a classic dish that instantly warms your heart. Even now as I battle to recover from serious food poisoning, I crave a hearty soup of Sopa de Pollo. Now one thing’s for certain– no two Chicken Soups are alike! In fact, there are very few dishes that I can think of that vary as much as this dish. However, regardless of how you make your Chicken Soup, homemade Chicken Soup is the absolute best! Perhaps it’s the slow simmered bone broth or maybe it’s the fresh veggies, but homemade Chicken Soup tastes a million times better than anything you buy in the store or get from a can. Whenever one of us in the house gets sick, I immediately go into Sopa de Pollo mode. I gather the Chicken- preferably a mix of chicken breasts and drumsticks- the veggies, pasta, and most importantly, the malagueta aka allspice. The who? The what? Now hear me out– Dominican Chicken Soup is NOTHING without malagueta. This spice gives the soup its classic Caribbean flavor. I honestly can’t have Dominican Soup without it! Keep in mind, that Dominican Chicken Soup varies greatly from house-to-house. It even varies each time I make it. Some people swear by adding potatoes, while others must have it with corn on the cob. For me personally, auyama aka Kabocha Squash is a non-negotiable. It has to be in my soup! Then again, I’m an auyama fanatic but I also love the natural yet beautiful color it gives the soup. It also adds a subtle sweetness that will have you coming back for more! So the malagueta (allspice)… regardless of what HAS to go in your Dominican Style Chicken Soup— allspice is a must. It’s a cultural element to the recipe that simply can’t go missing. Now if you’re not crazy about it or find it weird, give it a try. Remember that you can always start small and build yourself up as you acquire the taste. But whatever you do, do NOT bite down on whole allspice even after it’s been floating around in your soup and brewing for over an hour. You’ll bite straight into bitter-town and wish you hadn’t. Growing up, my grandmother cooked plenty and I draw a lot of the inspirations for my recipes from her. But my aunt and Godmother is the soup queen. She’s the one that I turn to whenever I need to master a soup. She’s also the only person I know who can make a soup out of air! I swear I’ve seen her cook up a soup enough to feed a village with little to no ingredients. My aunt taught me that the secret to making a good and hearty soup is time. She taught me that the longer you let ingredients simmer, the tastier the both. Over time, I taught her a few tricks myself. You should see her now with a hand held blender! She’s truly a soup queen! Making Sopa de Pollo is pretty straight forward. 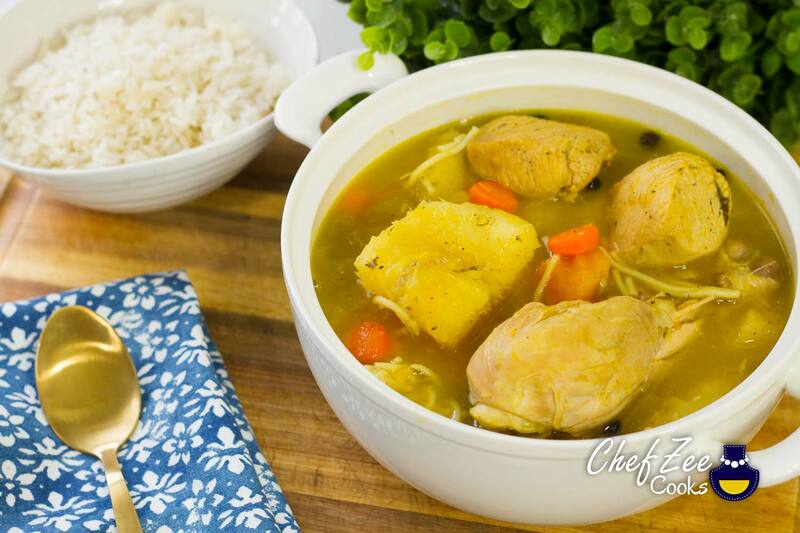 If you’ve tackled my Sancocho Dominicano recipe, then this one should be a walk in the park! 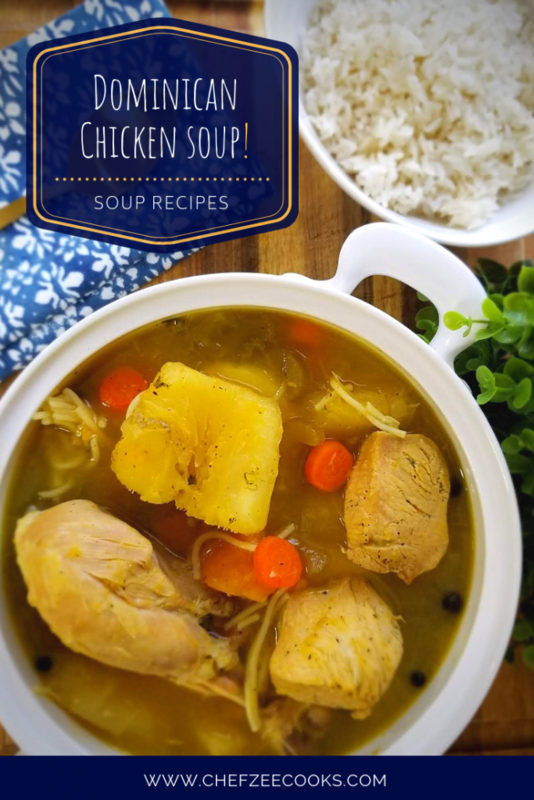 However, I must warn you– Dominican Style Chicken Soup can easily turn into Chicken Sancocho! The change can happen suddenly and if it does… don’t worry. It just means you have a much tastier soup! Are you hungry, yet? Watch my step-by-step tutorial on How to Make Sopa de Pollo Dominicana | Dominican Style Chicken Soup on my YouTube Channel: Chef Zee Cooks!